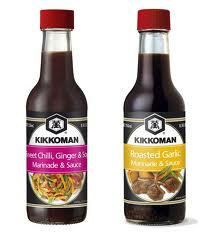 On Checkout 51’s list this week (Sept 5-11, 2013) is Kikkoman sauces and marinades, any Kikkoman sauce or marinade, excludes dry seasonings. Starting as a simple mixture of soy sauce and spices, teriyaki has been popular since it was first created in Japan. The lustrous sheen of the sauce inspired the name “teriyaki,” or glaze-broiled. Japanese-Americans in Hawaii added fresh ginger, brown sugar, pineapple juice and green onions to produce the teriyaki we know and love. You will get $0.50 cashback rebate at Checkout 51. Here’s a pic of what it looks like. I found a couple prices of it at a few stores.